abstract: Updated April 21, 2011 – A magnetometer measures disturbances in the magnetic field in Earth’s upper atmosphere. HAARP was broadcasting a 2.5 Hz frequency (the signature frequency of an earthquake) from just before midnight on March 8, 2011 and continued to broadcast the frequency March 9, 2011 and March 10, 2011. The 2.5 Hz frequency continued to be broadcast and recorded by the magnetometer for another 10 hours the day of the Japan 9.0 magnitude earthquake. By beaming the frequency at a specific trajectory HAARP can trigger an earthquake any place on Earth. A short burst isn’t enough to disturb solid matter (the Earth crust) so they keep beaming the 2.5 Hz earthquake frequency for hours or days – until the desired effect is achieved. 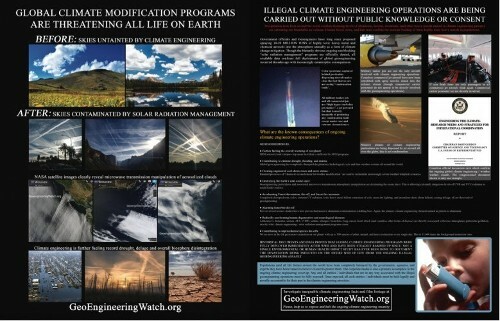 Evidence from HAARP’s own website revealed that the U.S. government was acting in violation of the ENMOD treaty – use of weather modification techniques (HAARP) for the purposes of inducing damage or destruction. HAARP broadcasting data published on the HAARP website coincided with a number of recent major catastrophes such as the 2010 Haiti earthquake, the 2010 heatwave in Russia, the major floorings in 2010 in China and Pakistan and the major earthquakes in Haiti and Japan ...(under the Obama Administration). The Japan 9.0 earthquake offered the most damaging evidence of the U.S. government using HAARP to induce major damage and destruction against a foreign state. HAARP’s magnetometer data showed the World that HAARP (jointly managed by the U.S. Air Force and U.S. Navy) began broadcasting the earthquake inducing frequency of 2.5 Hz on March 8, 2011 and continued to broadcast the frequency, March 9, 2011 and March 10, 2011. HAARP wasn’t turned off until 10 hours after the Japan 9.0 magnitude earthquake triggered on Friday, March 11, 2011 ...at 05:46:23 UTC. Smaller earthquakes have continued for weeks without being registered on the HAARP magnetometer. Why? Because, as stated before a magnetometer measures disturbances in the magnetic field in Earth’s upper atmosphere. It is not a seismometer which measures motions of the ground. The magnetometer doesn’t measure seismic activity, it measures and records electromagnetic frequencies in the Earth’s atmosphere. HAARP’s antenna array beams the 2.5 Hz earthquake inducing radio frequency into the atmosphere where a magnetometer can record and provide concrete evidence of a U.S. weather modification and earthquake triggering attack against foreign states. In order for HAARP to get funding the people who first created HAARP needed funding. That funding was made possible by the U.S. government. If you were to look at Congressional records you would find documents that state one of the many official purposes of HAARP ...penetrating the earth with signals bounced off of the ionosphere. Congress was informed by people in the High Frequency Active Auroral Research Program that the bounced signals would be used to look inside the planet to a depth of many kilometers in order to locate underground munitions, minerals and tunnels. If you bounced the known earthquake signature signal (2.5 Hz) for a sustained period of time an earthquake could triggered many kilometers inside Earth’s crust. The U.S. Senate actually set aside $15 million dollars in 1996 (Clinton and Al Gore Administration) to develop this ability alone — earth-penetrating-tomography. Under pressure from the International community the HAARP website is up again. No data is available from April 7 to April 12, 2011. Data before and after shows the signature frequency of an earthquake (2.5Hz) being transmitted. Also shows energy spikes which indicates active weather modification. Now that the website is up again, you can view data for the Japan earthquake at http://137.229.36.30/cgi-bin/scmag/disp-scmag.cgi?20110311. From the magnetometer induction data you can see 2.5Hz (earthquake inducing frequency) being broadcast and recorded for several days before the 9.0 magnitude earthquake. To see what a normal (no HAARP broadcasting) day looks like view the magnetometer charts for the days of March 15, 16 and 17 – March 16, 2011 http://137.229.36.30/cgi-bin/scmag/disp-scmag.cgi?date=20110316&Bx=on. No earthquake inducing broadcast was detected from March 15 to March 27, 2011. On March 28, 2011 a low powered broadcast was detected from approximately 12:00 am to 3:00 am. 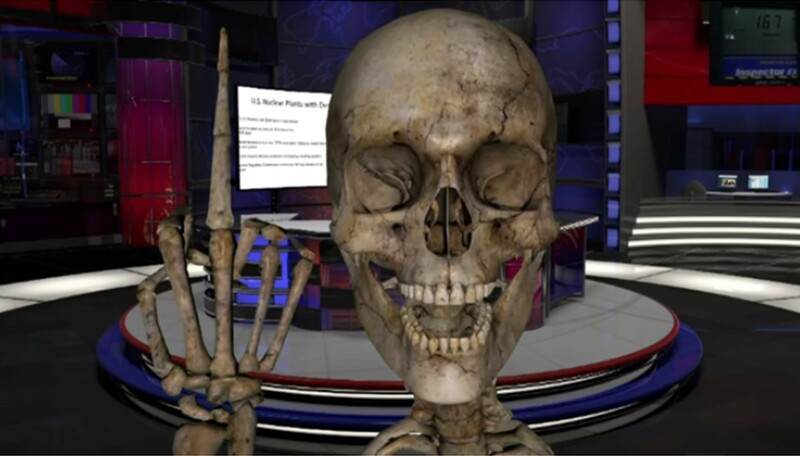 Broadcasting resumed on April 2, 2011. April 6, 2011shows you what the magnetometer charts looks like when a solar storm blasts Earth. No data is available from April 7, 2011 to April 13, 2011 – a shutdown. Starting April 15, 2011 and ending approximately 10:00 a.m. April 16, 2011 ... the earthquake inducing frequency of 2.5Hz was detected as being broadcast. The western U.S. is under an all-out climate engineering assault, California most of all. The Weather Makers can shut the hydrological cycle off from the once 'Golden State' for as long as they wish. Satellite images and NOAA maps shown in this presentation are shocking and revealing to say the least. Whatever one wishes to consider as the agenda of those in power, one conclusion is certain, the drought in California is a direct result of the ongoing climate engineering insanity. Weather warfare is now being waged on the American population. 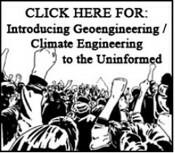 "The stated objectives of the climate engineers is to spray 10,000,000-to-20,000,000 tons of aluminum nano-particulants into the atmosphere every year. We know now from studies, that without the aluminum component, there would be no Alzheimer's Disease ...and, there would be a normal human lifespan of 100 years." – Dane Wigington. Linderman Unleashed Radio Show: Curt speaks with Dr. Blaylock about devastating health effects of chemtrails and geoengineering programs implemented in secret without public consent. Is a lifeless planet on your radar? Planet Earth & all that live here, are in the throes of unimaginable and immediate upheaval. Even at this late hour, with the walls closing in from every side, the vast majority are completely oblivious to the tidal wave that is towering above our heads. 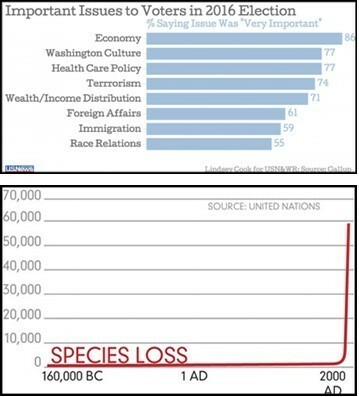 Earth's climate and life support systems are unraveling at unimaginable speed as we free-fall into the 6th great mass extinction on our planet. In spite of all this verifiably and undeniably occurring, for the vast majority the immediate threat of a lifeless planet is not even on the radar, (see below). 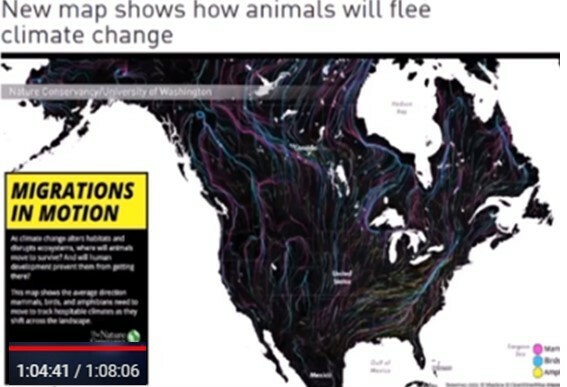 Note map (above): Animals to flee coast of Pacific Basin & Atlantic ocean filled with Fukushima radiation & other nuclear & petro- industry waste. The life that Earth has supported for untold millions of years will soon perish if there is not an immediate and total change of direction for the human race. The total moral depravity, deception and betrayal by mainstream media has now ensured that the population as a whole has no idea how close the current reality is to completely and permanently disintegrating. In the last 40 years over half of Earth's wildlife has been killed off while the human population has doubled in the same period. How long can such a trend possible continue? – 200 species of Earth's plants, animals, & insects go extinct every single day. Many claim chemtrails do not exist, many claim they do. That aside, what does exist? ...is geoengineering, solar radiation management, stratospheric sulfate aerosols and microwave installations that can push jetstreams and clouds artificially laden with heavy metals for the purposes of weather control or weather warfare akin to weaponizing the Earth ... using the Earth and its systems as weapons of war ...weather ...water ...drought. It's no coincidence that the extreme use of aluminum in chemtrails coincides with Monsanto developing an aluminum-resistant seed. Stratospheric Sulfate Aersols Geo-engineering (SAF-SRM) – Stratospheric sulfate aerosols create a global dimming effect that makes them a candidate for use in geoengineering: (1) to limit effect & impact of climate change from increasing greenhouse gases; (cont bottom of page). The battle to control the flow of information is being advanced by an increasingly desperate power structure. Will the population stand silently by? What factors are fueling public complacency and apathy even when facing existential threats? The U.S. continues to topple democracies in other nations, the latest is in Honduras. (Video, here) Of major concern is evidence they are spraying tons of nanosized aluminum compounds. It has been demonstrated in scientific and medical literature that nanosized particles are infinitely more reactive and induce intense inflammation in a number of tissues. Of special concern is the effect of these nanoparticles on the brain and spinal cord, as a growing list of neurodegenerative diseases, including Alzheimer's dementia, Parkinson's disease and Lou Gehrig's disease (ALS) are strongly related to exposure to environmental aluminum. We know that older people have the greatest reaction to this airborne aluminum. Because of the nanosizing of the aluminum particles being used, home filtering system will not remove the aluminum, thus prolonging exposure, even indoors. In addition to inhaling nanoaluminum, such spraying will saturate the ground, water and vegetation with high levels of aluminum. Normally, aluminum is poorly absorbed from the GI tract, but nanoaluminum is absorbed in much higher amounts. This absorbed aluminum has been shown to be distributed to a number of organs and tissues including the brain and spinal cord. 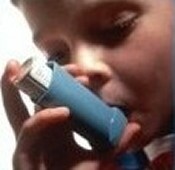 Inhaling this environmentally suspended nanoaluminum will also produce tremendous inflammatory reaction within the lungs, which will pose a significant hazard to children and adults with asthma and pulmonary diseases. Steps need to be taken now to prevent an impending health disaster of enormous proportions if this project is not stopped immediately. Otherwise we will see an explosive increase in neurodegenerative diseases occurring in adults and the elderly in unprecedented rates as well as neurodevelopmental disorders in our children. We are already seeing a dramatic increase in these neurological disorders and it is occurring in younger people than ever before. As weaponry and warfare have become more sophisticated, so their long-term effects have become more insidious and deadly. Whilst it is easy to identify the visible aftermath of war, how can we gauge less obvious costs such as poverty, famine, environmental problems and civil unrest? Each year governments pump huge amounts of money into military research programmes but what do we really know about the long-term consequences? It is difficult to believe that our planet has been weaponized before our very eyes, but that is exactly what has happened. First, we were seduced by the convenience of a wireless world; then, atmospheric weather experimentation in the guise of carbons 'climate change' converted the air we breathe into an antenna. Now, the geo-engineering we’ve been subjected to for two decades is being normalized as the 'Star Wars' Space Fence rises around and within us. Is this the Space Age we were promised? Blazer: When I take a look at NASA’s website, they describe the atmosphere primarily in terms of five layers. There is a troposphere, which is basically from the surface to five to nine miles up. There is the stratosphere, which is from the troposphere up to 31 miles and includes the ozone layer. There is the mesosphere, which goes from the stratosphere up to 53 miles. Then there is the thermosphere, which goes from the mesosphere up to 372 miles. Then there is the exosphere with an upper limit of up to 6,200 miles. Then there is this other thing called the ionosphere, which I found very interesting. It’s an abundant layer of electrons and ionized atoms and molecules that stretches from 30 miles to edge of space – some 600 miles up – overlapping into the mesosphere and thermosphere. People think of the ionosphere as being one of those layers, but it’s actually not. It’s a combination, and that is really where they are concentrating in terms of where they are creating this space fence and ionizing the planet. Is that correct? Freeland: The space fence goes to the top of the ionosphere. A lot of the things that are creating what I think of as the space fence near Earth orbit, can be thought of as a ring around the planet, as depicted in the illustration that I have on the book cover. That ring, like a Saturn ring, rests around the equator and probably starts up at the top of the stratosphere. It’s not that high up – not as high up as the top of the ionosphere by any means, but it is essential to have that level of metal conductivity in nanoscale. The space fence, like I said, started out with the Strategic Defense Initiative as a sort-of necklace across the south, from the East to the West in the United States. It was radar installations that were watching the sky. They have continued that narrative now that they have the atmosphere ionized from the technology all the way from the chemical trails loaded with the nanoparticle heavy metals for conductivity to the ionospheric heaters, all of the radar installations, all of the NexRads across the United States, and all of the wind farms and the fracking wells. I explain thoroughly the infrastructure of this tremendous effort to turn the entire planet into a surveillance instrument, yes, but also a lockdown in many, many ways. Lockheed Martin’s narrative is that the space fence is primarily counting debris rotating around the planet so that we can protect our satellites, which, of course, are essential. They are the eyes for all defense of the military. But what they don’t say is that the space fence is also able to see onto the planet. The level of surveillance now, thanks to Billy Hayes, the HAARP man who led me through one infrastructure element after another and pointed the way for my research, the ability to see down to a half-centimeter from far-distant space satellite geostationary or mobile – is extraordinary. I think that this is part of our problem of why, even when people hear me talk or read, they have a hard time imagining the level of control that is going on now that we have an entirely wireless world and wireless technology that people are addicted to. All of these are what the military calls ‘dual use’. These are all about using it for military objectives while making profits from civilians for their convenience and comfort and entertainment. It’s pretty big. I completely admit that, and that is what I try to show, and I try to break it down a bit for people to get hold of how it’s working together through calibrating these instruments and through the pulsing of frequencies, this concept of pulsing frequencies – everyone is going to have to get beyond their high school science courses and get interested in the technology that they are dependent on now. They are going to have to learn how it works a bit. That’s what I tried to get going by writing, Under an Ionized Sky. ... ... ...Blazer: People think of the ionosphere as being one of those layers, but it’s actually not. It’s a combination, and that is really where they are concentrating in terms of where they are creating this space fence and ionizing the planet. Is that correct? Most of the ring around the planet is formed of metal nanoparticles spewed by sounding rockets that really don’t go much higher than the stratosphere and then centrifugal force draws them around the planet. They are testing various things up there, and that is why they are called ‘sounding rockets’. They will spew particularly lithium from their combustion chambers on their way up, and those nanoparticles of that lithium and whatever else is being spewed will eventually rest in that ring, a ring very similar to that around Saturn. What I try to point out as the book progresses is how that ring is about the lockdown. ... ... ...It can hold information, it is essential to communications over the horizon from the ionizing going on in our atmosphere, thanks to the ionospheric heaters zapping the ionosphere. It would also have to do with vessels and exotic propulsion craft going out into the solar system. To me, the space fence is primarily about holding us between that ring and our dome of ultra-low frequency in our ionized atmosphere. We’re really in it now. It’s not a matter of the future; we are in it now. There is recently out an article about how this ULF buffer has formed around the Earth. Well, that has to do with the ring forming around our planet, all the way down to the ground installations. In a way, we are held in the vise grip of this Tesla communication dome. You could think of it as a Faraday cage as well, except that we are kind-of trapped inside of it. That is my conception of the space fence. It is far more than counting debris in space and protecting our satellites; it is actually a means to have full-spectrum dominance over Planet Earth before setting out for the rest of the solar system. ... ... ...Blazer: So we have kind of made the planet into a wireless network. Freeland: Yes. You mentioned ‘prison planet’. I think of the C. S.Lewis science fiction book, Out of the Silent Planet, and I’ve been spooked many times while writing the second book. It just sounds so much like what he described where we are cut off from the cosmos. We cannot hear the cosmos, and the cosmos cannot hear us. This is dire. We can’t see the stars at night. During the day we are doing without 22% of our sunlight. We have 18% less oxygen in our bodies. We are, in a way, becoming the Silent Planet. In the 1960’s, we knew that John Kennedy had been assassinated from inside and that Oswald had nothing to do with it. Then, of course, as you know, Martin Luther King was killed just a few years after that. Then just a few months after him, Robert Kennedy was killed. These were our three heroes, and my generation went into a very turbulent time in which they became subject to the CIA and FBI’s COINTELPRO interference with our youth. Our rock stars were killed if they were political. All sorts of things were going on. ...not the least of which is how issues upon which the future welfare of the Earth and its peoples hinge are marginalized, and scientists and doctors who step forward to tell the truth are discredited, ostracized, or killed. High-tech research, whether at university, corporate, or government labs, is funded by the military and its myriad contractors while compartmentalization, need-to-know security clearance, and non-disclosure agreements signed in blood keep the secrets as the patent office and 'good old boy' peer review system play gatekeeper. 'Divide and hide' is the name of the national security game. Like the Egyptian myth of Isis and Osiris that Freemasons are so fond of, the body parts of an ancient globalist dream to which we are all subject lie scattered around us, awaiting our ability to piece it all together and interpret what is being hidden from we the people. Our school conditioning was to keep issues compartmentalized and separate from each other - geoengineering, GMOs, genetics, WiFi, 5G, Morgellons, Transhumanism, vaccinations, electromagnetic targeting of individuals and populations, mind control, etc. – when the truth is they are all connected by a common globalist intent, just as CERN, ionospheric heaters, fracking wells and wind turbines are all calibrated to work together for Space Fence control. The issues confronting us are separate battles in a vast, ongoing spiritual war for the future of humanity and definition of life itself. Extreme weather, water quality, immune system degeneration, creature extinctions, acid oceans and alkalinized soil – all is occurring in tandem with the moral degeneration of society, death of the middle class dream, rise of Agenda 2030 and its artificial intelligence, optogenetics and neuroscience. All are scenes grown large and wireless from the elite Luciferian dream known yesterday as internationalism and today as globalism. The Earth and its atmosphere are being geoengineered, and it is not just about weather, wireless communication, drones and directed energy weapons. It is about aiding in the breakdown of the biosphere so all of life can be genetically altered and controlled. ... ... ... I was very interested because of the files that I was keeping for the SubRosa America series that I was writing, and I had one on chemtrails and one on HAARP. It was through Clifford that I began to realize that the two were really very integrally set up together to produce a certain kind of atmosphere. Clifford collected my blood and my saliva, and I looked under his microscope and saw the Morgellons creature that he had really discovered and was trying to analyze and test in various Petri dishes. It was sucking the iron out of my red blood cells. You can imagine how wakeful that experience was! When I eventually returned to the Pacific Northwest, Adam Parfrey at Feral House asked if I could write a book on chemtrails. I had done some work for Adam while I was in England. I think that he was trying to give me a chance to publish a little broader. components. The other thing that Clifford has told us is that there are biologics being dispersed as well. Freeland: Yes, along with the sensors that are also nanoscale and the microprocessors, which are tiny computers on the nanoscale. We have inhaled all of these. With the biologicals, the Morgellons is probably only one of the biologicals that is being prototyped. When you’re talking about planetary control, you’re going to have to have more than a lab – or even 100 labs – to experiment with. You’re going to have to have open field experiments. That is kind-of what I see going on now. When I say that the atmosphere is ionized, I’m talking about plasma. We have a fourth state of matter now completely in our atmosphere. We’re not breathing the same air that we were breathing years ago. This is heated because the atmosphere is electric-ready all the time, especially with the heavy metals that are falling slowly – lofting down. Nano more than micron-scale offers a better loft and therefore drift rate down from the stratosphere where the jets are laying these, and also the rockets. So plasma is real. It’s even recognized by science, although it’s a little hard to get scientists to recognize scalar waves unless you look in the right places. They’ve been dealing with it for decades. Freeland: They call ‘scalar waves’ gravitation or ‘gravity waves’ and that is okay because in a way scalar waves are like that. The important thing is that we are witnessing scalar technology, and scalar waves are different from electromagnetic waves, but each can be converted into the other. That is going on as well. For that I always recommend that people read someone who really knows a lot about it, and that would be Tom Bearden, and in Europe it would be Konstantin Meyl, considered by many to be the next Tesla. Blazer: Hopefully this has served as a potent enough introduction to get people interested in getting your book, looking at some of the presentations we are going to have on the link, and then I want to follow up. In your book we have got an introduction, Planetary Lockdown, Geoengineering in the Deep State, Catching up with Chemtrails, and HAARP. Chapter 1: Project Cloverleaf ...a historical project that creates context. Chapter 2: Ether, Scalar Waves, and Plasma. Chapter 5: The Revolution in Military Affairs. Chapter 6: Mastering the Human Domain. Chapter 7: The ‘Star Wars’ Space Fence Rises Again. Chapter 8: Boots on the Ground. Chapter 9: The Temple of CERN. Chapter 10: The Covert Ascendance of Technocracy. Chapter 11: The Unlawful ‘Silent War’ Against Citizens. Conclusion: ‘Cure Yourself ’ – recommendations on how to protect yourself. Let me just make two quick comments. I spent a lot of time in the woods in Montana, and I love to hike. I’ve been doing it since 1969. What I will tell you is that there is a qualitative difference in the experience between then and now. Two of the things that I can say is that the sky is no longer blue, and the trees are no longer really healthy. When dead trees fall and come across my road, I have to cut them up and take them away. In studying them, they are lighter (in weight); they don’t have as much substance (mass, density). They have internal porosity that wasn’t there before. People blame it on the beetles and droughts and this type of thing, but the beetles are there because of all of the damn aluminum that has been bombarding our ecosphere. Freeland: It’s an easy answer for me. I spent so much time when writing Sub Rosa America. I spent so much time trying to walk in the shoes of the global elites and what they were like. I was fortunate to have a couple of clients when I was ghostwriting who are from those families, so I was able to learn from them about pretty horrendous childhoods in preparation for wielding the power that they would have to wield as members of these dynastic families. So I would have to begin with dynastic families. The ones who I always think of are the ones who walked away from World War II richer than they had ever been, and that would be the big pharma families of Europe. Next would be organizations formed by the dynastic families and vast international corporations which dominate all of the major industries that leech off of the poor primarily. They all form the Council on Foreign Relations and the Trilateral Commission. of theories, and yet these theories were often as close to the truth as you can get, but they were used to discredit people. There is some very sly capability in these people who are able to continue from generation to generation and maintain and double the wealth of their family or their corporation or however you look at it. These are the people running things. They are running the military. I constantly try to use the term ‘Military-Industrial-Intelligence Complex’ because there are a lot of good people in the military. There are a lot of good people in the intelligence apparatus. There are a lot of good people in any of these, but as a conglomerate and a top-down hierarchic structuring (these organizations are problematic). ... ... ... It’s just that ‘we the people’ have been slow to come to this knowledge, particularly in the United States, because we were bought off for decades by convenience and toys and two cars in every garage, etc. in the capitalist dream. We are slow on the uptake, and it is only now that we are going to begin to suffer that people are finally interested. Blazer: I am feeling safer and safer because, after all, our progressive youth and progressive z, x, and millennial generations are out there telling us that the real enemy is the NRA and that we should give up our assault rifles. Freeland: Or that our real enemy is the Russians. They are bringing that one back. Freeland: They can find the books at Amazon, and Feral House is the publisher. I do hope that people will read these books, even if it is just a few paragraphs a day, because knowledge is power. I know that this is the way. There is no marching in the streets against this one. There are no petitions against this one. There is no democratic process for this one. This is national security, and our greatest hope is to teach ourselves what the technology is, what it can do, and then to make the changes in our lifestyles to prepare for the effects of those technologies. ... ... ... My website is www.elanafreeland.com . You can also find me on Facebook. This article is based on a speech given at a large Symposium on Science and Spirituality in Germany in 2013. 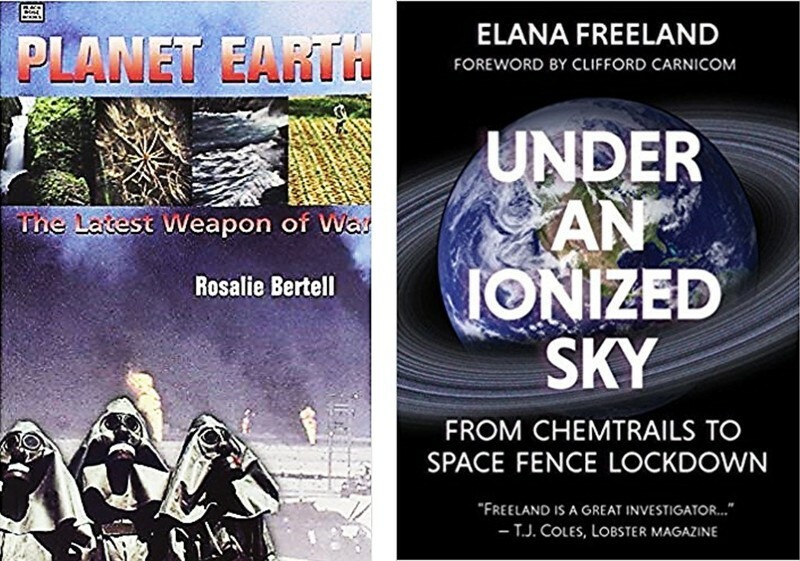 It addresses and tries to inform the public of the still unknown issue of military 'geoengineering', as described in Dr. Rosalie Bertell´s research, and tries to make clear that the officially propagated thesis of C02 as the reason behind the growing climate chaos in the world is not true. It is instead hiding the consequences of 70 years of development of a new military geo-warfare, applied internationally. For a better understanding of the issue the article tries to include an ecofeminist and patriarchy critical theoretical analysis of the facts we know so far. “It is not Greenhouse Gases—it´s the military!” Dr. Rosalie Bertell stated emphatically when she was interviewed in 2010 at the thirtieth anniversary of the Right Livelihood Award (an international award that recognizes and honours those offering practical and exemplary answers to the most urgent challenges facing us today), which Dr. Bertell herself received in 1986. After her book about the dangers of low nuclear radiation to our health, No Immediate Danger: Prognosis for a Radioactive Earth, released in 1985, she published Planet Earth: The Latest Weapon of War in 2001, which offers an analysis of post-wwii military technologies in the fields of nuclear and post-nuclear weaponry. Today we call these technologies “geoengineering.” There is, nevertheless, a lot of confusion about geoengineering that Dr. Bertell tried to clarify until she died in 2012. I have assumed the mantle left behind by Dr. Bertell, and in 2010, founded the “Planetary Movement for Mother Earth” in Germany/Austria (www.pbme-online.org). ...chemtrails are for changing the atmosphere into a PLASMA for Directed Energy Weapons of Mass Destruction (DEW), using weaponized weather, directed energy weapons, the weaponized power grid, and weaponized telecommunications grid, (here) & (here). Our military has been high-jacked by a corporate (fascist) structure that does not acknowledge life, (here). And, our children are sacrificed in wars that DO NOT promote democracy or justice but are fought to increase corporate profits for those companies owned by the families that own the Fed. You know this, already. It's time to eliminate the Fed, by trying the families that own the Fed for treason (since they finance both sides of every war we fight and profit from the blood of our children). When will you act? What will it take? You know what is right and wrong. Stratospheric Sulfate Aeosols Geo-engineering (SAF-SRM) – The ability of stratospheric sulfate aerosols to create a global dimming effect has made them a possible candidate for use in geoengineering projects; (1) to limit the effect and impact of climate change due to rising levels of greenhouse gases; (2) Delivery of precursor sulfide gases such as hydrogen sulfide (H2S) or sulfur dioxide (SO2) by artillery, aircraft; and (3) balloons ... has been proposed. — Tom Wigley calculated the impact of injecting sulfate particles, or aerosols, every one to four years into the stratosphere in amounts equal to those lofted by the volcanic eruption of Mount Pinatubo in 1991, but did not address the many technical and political challenges involved in potential geoengineering efforts. If found to be economically, environmentally and technologically viable, such injections could provide a “grace period” of up to 20 years before major cutbacks in greenhouse gas emissions would be required, he concludes. — Direct delivery of precursors is proposed by Paul Crutzen; This would typically be achieved using sulfide gases such as dimethyl sulfide, sulfur dioxide (SO2), carbonyl sulfide, or hydrogen sulfide (H2S). These compounds would be delivered using artillery, aircraft (such as the high-flying F15C) or balloons, and result in the formation of compounds with the sulfate anion SO42. — According to estimates by Council on Foreign Relations, “one kilogram of well-placed sulfur in the stratosphere would roughly offset the warming effect of several hundred thousand kilograms of carbon dioxide.